It’s been a fairly mild, dry summer in Delaware so far this year, and my family and I have been spending tons of time enjoying the outdoors. Because of all our outdoor adventures, my kids have started being more interested in all the plants, flowers, and bugs that we’ve been finding along the way. 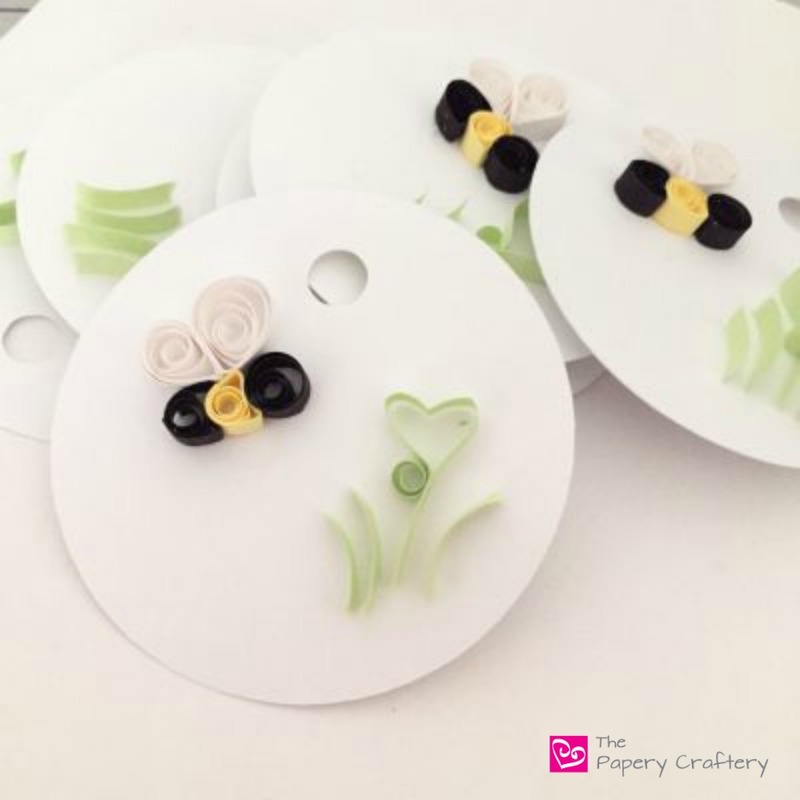 They’ve inspired me to revisit some of my designs from last year, like the custom beehive I created and also my quilling paper bumble bee gift tags. I had written a post last Valentine’s Day for about the inspiration behind my Love Bug Tags, but now I’m sharing the exact step-by-steps for the bees! Fairly simple supplies for this project: yellow and black quilling paper for the body of the bee, white for the wings and the green of your choice for the grasses. I believe the exact shade of the pale green I’m using here is “Celery”, but use whatever you have. I’ll start with the bumble bee’s body. Each bee needs 2 loose coils in black and 1 loose coil in yellow. For the mini bees I’m quilling, I’m using 3 inches for both the yellow and black strips. After rolling the coils in yellow and black, glue the ends, and let dry. Once the glue has set, use a needle tool to make an indent on one side of one of the black coils and the yellow coil, creating a half-moon shape. Using a small amount of glue, attach all 3 pieces of the bumble bee’s body together. The black coil that hadn’t been indented is meant to be the head of the bee. I like to use a few straight pins to really push my coils together. I find it makes the bee’s body look more complete. While the body of the bugs are drying, make the wings. I like the wings of my bumble bees to be on the larger size, so I’m using 4 inch strips of white quilling paper. Roll and pinch each white strip into a teardrop and glue 2 to each bee. As these gift tags were originally designed to celebrate Valentine’s Day, I added some heart-shaped grass, just to give my bees something to bzzz around. Start with a 4 inch strip of pale green paper. Next, use a needle tool to roll a coil about half-way down the length of the strip. Remove the tool carefully, so the coil stays in place. Bend the strip backwards to create a loop on the top with the coil on the outside. Secure the loop using a small dot of glue a couple pins. To finish the heart grass, use another pin to push in the center of the loop. This will make the loop into a heart shape! Sometimes it can be helpful to manipulate the sides of the heart with your fingers. And there you go! Your bees and grass are ready to attach to the tag of your choosing. I like 2 inch white circle tags, but use whatever you’d like. I also add a few extra blades of grass to even out the design. How would you use these little bumble bees? Leave me a comment below and share your projects! I can’t wait to hear about it!